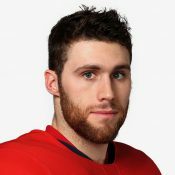 Quinton Howden is a hockey player from Oakbank, Manitoba. Originally drafted in the first round to the Florida Panthers in 2010, Howden has played parts of four seasons in the NHL. Howden has spent most of his professional career with the San Antonio Rampage, Florida’s farm team. In the 2016-2017 season played for the Manitoba Moose, dressing for the Winnipeg Jets a handful of times throughout the year. Since leaving the Moose in 2017, Howden has been playing for the KHL’s Dinamo Minsk. A two-time member of Team Canada at the World Junior Hockey Championships (2011 and 2012), Quinton is no stranger to wearing the maple leaf. In January the 26 year old was selected to Canada’s Olympic men’s hockey team, and will make his Olympic debut in PyeongChang at the 2018 Olympic Winter Games.